No, we a firmly planted in the Classic age of Pinball…. Cool, I’ve been reading your posts with joy. I’m planning a pinball myself and have been searching for option for the past two years. I played around with the easy programmable Arduino and the PD16 is on my wish list. You mentioned some very useful info. Thanks for that. I’ll sign up and I hope I may bother you with questions somewhere in the future. My posts are kind of jumping around a bit in the design and building process, based on what material I have ready and what I think is most relevant. If you have any specific requests, let me know and I’ll try to put together a post. I just recently discovered your site. My Makerspace is looking at building a machine from scratch. I’m hoping you can do a post on power supplies. Absolutely great writeup! Thanks for taking the time to post this. Great on so many levels. Hello , I am trying to build a custom pinball too with an arduino … http://pinballhomemade.blogspot.com.br/ … But this one’s pinball is getting very good. Congratulations! I was wondering if you’d be willing to share your Arduino code and board schematics? It looks very interesting! Great blog! I’m building an Arduino-based pinball and have all the boards, parts, and power supply wired up. However, I tried your code for testing solenoid and got nothing. I was hoping you could tell me I overlooked something. I have my Arduino Uno connected to the Mini-Master RS-485 thru the TX pin1 on the Arduino to the TX pin on the RS-485. Do I need to connect RX as well? Any ideas? Or maybe a photo of how you’ve wired up the arduino to the rs-485 to the pdb-16. – Check your dip switch settings on the Power Driver. – Swap solenoid banks (i.e., move your connection over to the other bank if it’s not being used). – Make sure your getting 5v to all boards. – Make sure your GNDs are all connected back to the same common source. Perfect! The pictures helped immensely! Thanks! I changed my wiring from the Arduino 1 TX pin to the ICSP header for SPI. Ran your SerialSolenoid Tester code and I could hear my dual coil flipper solenoids very faintly buzz. I tinkered around with changing the delay in the code but that just changed how long the faint buzz lasted. I guess I was hoping for more of a satisfying solenoid fire. So anyhow thanks to your help, I think I now have the Arduino communicating thru the rs485 mini-master to the PDB-16 correctly. Now I think I’ll look at those dip switches and connecting common GND. What voltage are you running at? I find most flippers need around 35V, and if you’re using a power supply, you might be current limited as well. May want to check with a different solenoid, or better yet (what I usually do for testing) is set up a bank of 24V or 36V indicator lamps. That way I can see that the driver circuit is working separate from any coil issues. Good question about what voltage…I don’t know. 35V sounds about right for flippers. I had better luck today. I changed the dipswitches to 1-4 off 5-8 on. When I ran the Arduino serial solenoid test. I entered 8 into the serial monitor and I got a really satisfying (almost too much) sharp solenoid fire for the right flipper…and then the Bank A fuse blew. I tested with another fuse. Switched all the dipswitches off. Switched on dipswitches 5-8. Ran code. Entered 8. Same sharp report of the right flipper solenoid firing. Blown fuse. I have the Antek ps-4n70n24 connected to J5. One 70v connected at J3 running to the Common terminals for right and left flipper. Then 2 Power and 2 Hold wires connected to the solenoid terminals coming back to J7 molex connector. Anyhow, I’m off to buy some more fuses and to find out how to properly set dip switches. Flippers and Hold Coils are tricky. Does your flipper assembly have an end-of-stroke switch? 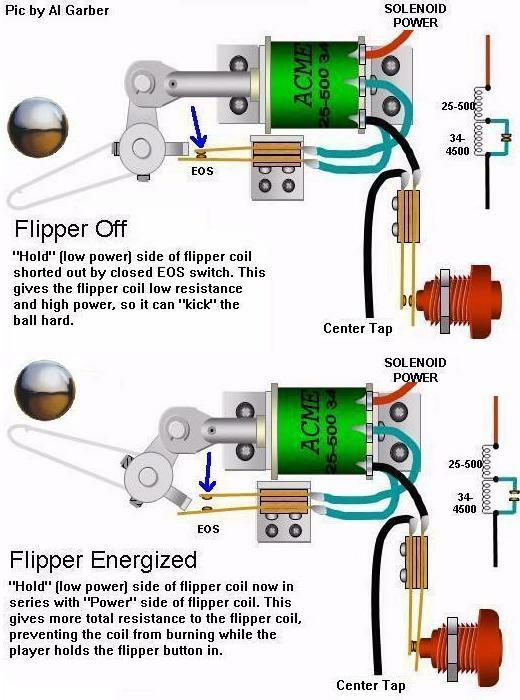 If you are driving the flipper Power Coil by itself continuously, you could easily blow a fuse. And if not the fuse, eventually burn out your coil (luckily the fuse goes first). I usually setup my flippers with Power Coil and Hold Coil in series, and the end-of-stroke switch shorting out the Power Coil. Your wiring may be different depending on the manufacturer and if the switch is normally-open or normally-closed. So, if your using the Power Driver 16 for flippers, you really only need two channels, Left and Right, and let the mechanism (usually) takes care of the hold circuit (depending on what you have). Just make sure it’s wired up dis-engage at full stroke! I think I’m following along with you. I have Williams Firepower flippers with EOS switches. I found a schematic that describes what I think are saying. I’m going to try wiring it like this. I’ve tried downloading your Visual Pinball files from vpforums.org, but it keeps telling me that I don’t have permission. I registered for the site, and am logged in when I try to download, but no luck. Hello, I’m new here and I’d like to echo what the others have said…fantastic stuff. I own a couple of machines such as Spirit of 76 and I’m a big fan of that era. I went to electronics/digital control school in the early 80’s, where we built and used Heathkit microprocessor trainers, with keypad (for hex input) and we would have killed for the Arduino stuff. This blog and what’s available today has really sparked my interest. One starting question if you don’t mind (and I’m doing my best to read everything on your blog first.) Above and beyond the Ardiono stuff, I’m wondering about the actual machine parts. Your Tattoo Mystique game would be a great example. Probably a good start; straightforward and it has a little bit of everything (drop targets, etc.) Where I’m initially having problems connecting the dots is that when I visit some of the sites you mention (Marco, etc.) there is a dizzying array of parts and most seem to be direct replacement parts for existing machines. I’ve been out of electronics for a very long time and so I’m guessing there is a path to this, such as buying the game schematics for the parts listed and figuring it out. Instead of spelunking for all this, I’m wondering if there is say a specific parts list for something like Tattoo Mystique, possibly with vendor links. Also, as Dan posted above, diagrams would be most helpful since I’m guessing the Marco, etc. parts come with no instructions since they are replacement parts for the original machines. Anyway, thanks again for creating the blog…it’s very inspiring! Thanks for putting this info out there for all of us. We are trying to do a Home brew Pinny project. I like the pinside displays and how you drive them. Would the there be a way to make an input score module, ie: you input 100’s 1000’s 10,000’s etc and the module then counts them up and displays it on the pinside display? Anyway, just another challenge to think about ! Wow! This is an amazing write up of your work. Have you ever fabricated ramps? I guess this is a tricky part because you want them as custom shapes (rather than buying existing ones). I’ve heard about vac forming. Do you know how the ones for commercial machines are made? And do you have any ideas of home brewing them? Thanks for sharing all your work. I’m building a pinball machine and was considering the supplies you mentioned. At the end you mention also adding large capacitors. I was curious if you could elaborate a little bit. Are they a necessity with the above mentioned supplies or only if needed? Also what are some typical values you’ve used. The old driver boards on mine had ones as big as 11000uF. Thanks for the wicked information! Caps aren’t absolutely necessary with these supplies, but they do help if you’re expecting to have multiple coils firing at the same time. Like, trying to reset drop targets while the flippers are active. Or, if your supplies are very far away from the end coil. Also helps with lighting on the 5V side if you’re using LEDs. It’s not too hard to find a large cap, something in the 10,000 uf to 50,000 uf range. But again, I have games that don’t use them, and as long as software handles errors, should be ok.